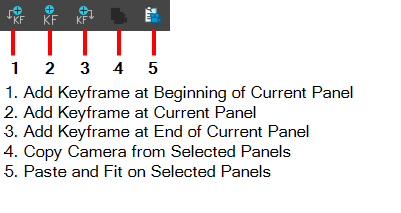 The Camera toolbar lets you add keyframes to the beginning or end of a selected panel, and copy and paste keyframes. Select Windows > Toolbars > Camera. Adds a keyframe to the beginning of the currently selected panel. Adds a keyframe to the current frame which is determined by the position of the red playhead on the Timeline. Copies a selected camera keyframe from a selected panel. Pastes a selected camera keyframe from a selected panel.